With Energy, Skill Shift and additional Skill Damage, Annelie has it all. 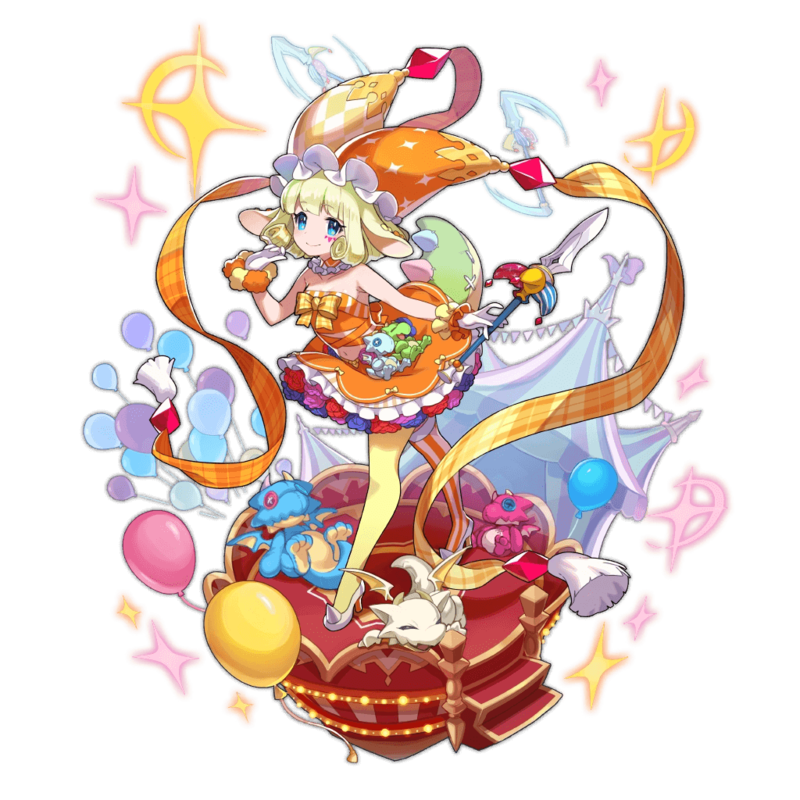 The HP condition for her Skill Damage is tricky, but also give her access to a higher magnitude of power than Halloween Elisanne. A near-perfect kit and much-needed compatibility with Shadow IO make her a worthwhile summon. Thanks to the availability of other Light Energy users such as Lucretia and Vixel, Annelie can expect frequent Strength boosts from being Energized. Making her grand entrance with the Circus of Dreams banner is Annelie, a 5★ Lance user with abundant damage-related passives. She brings desperately-needed Poison immunity to the roster, and works with both the Energy and Skill Shift mechanics. Similarly to Halloween Elisanne (who she shares stats with) using these attacks in tandem leads to a sizable Strength boost. The key difference is that when both of her Skills raise Energy Levels, she can fire off enhanced attacks more frequently. Teamwide benefits are sparse, amounting to only Energy Levels, but Annelie is a self-sufficient powerhouse who pulls her own weight and then some. She can bounce off of other Light Adventurers such as Lucretia and Vixel, who in turn help her capitalize on Energized: Strength +20% more often. Annelie is one of the few melee adventurers able to safely navigate Shadow IO, fearing neither spikes nor poison. The Skill name is quite literal-- Stunning Display inflicts Stun once upgraded. It’s a very brief condition, but powerful nonetheless and unlikely to be resisted by Shadow enemies. In contrast to the party buffs given by Halloween Elisanne and Dragonyule Cleo, Stunning Display is a rather ‘selfish’ Skill Shift. A personal energy level boost doesn’t feel nearly as tangible as teamwide support. Furthermore, Smiles on Parade has a low uptime, so becoming fully energized without teammate support will take quite some time. Though there's some leeway in a 70% HP Ability, Annelie must stay healthy to retain her massive Skill Damage boost. By contrast, Halloween Elisanne’s Skill Damage is unconditional. Cupid - Grants an enormous 40/60% STR boost while also providing a teamwide burst heal and crit rate buff. Cupid effectively rounds out the support role and helps with damage as well. Lindworm - More accessible 4* option for raw power. Jupiter / Astral Imp / Hinata - Easily unbound budget options. Deals light damage to enemies directly ahead, draws them toward the user, and activates "Skill Shift" if the attack connects. Phase I increases the user's energy level by one stage, while Phase II increases it by two stages. Phase III adds additional damage to the skill. Deals light damage to enemies directly ahead, draws them toward the user, inflicts stun, and activates "Skill Shift" if the attack connects. Phase I increases the user's energy level by one stage, while Phase II increases it by two stages. Phase III adds additional damage to the skill. Deals light damage to enemies directly ahead, and increases the entire team's energy levels by two stages. When an adventurer's energy level reaches level five, they will become energized, and their next attack or recovery skill will be upgraded. At this point, using any applicable skill will reset that adventurer’s energy level to zero.